Find hotel near Centro Comercial Plaza Bo .. 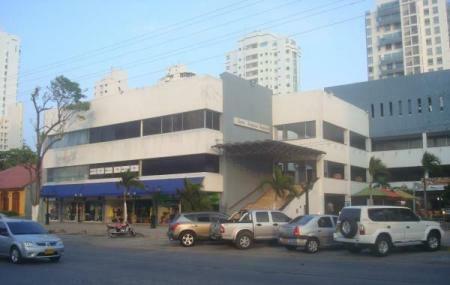 Located between the Old Town and the Bocagrande, this modern mall is a good way to take cure tourist fatigue. With a hundred local and international outlets and brands represented, a movie multiplex, a healthy number of dining options including a food court, and a play area for children, it’s a place you can spend an entire day at. Check the mall website calendar for upcoming events. They even have a car wash. Tourists usually end up at the mall if the weather is unbearably hot or simply stormy. It’s also convenient located in the same complex as the Cartagena Hyatt Regency Hotel. Individual restaurants and stores within the complex may have their own opening times. Mall is definitely amazing. Plenty of stores mostly all foreing brands. They do have a food court as well as a supermarket. Very convenient specially if your trying to run different errands at the same place. They do have parking which really amazed me. They have car elevators. Very high tech. They do charge for parking and will give you a discounted price if you purchased anything at the mall. They have very nice views for pictures from the food court balcony. The best part about this mall is the food court. It has an awesome selection of food places and really reasonable prices. There is also a movie theatre here and an incredible balcony to watch the sunset or just look at the beautiful beach line in Bocagrande. Nice mall but be aware of prices it's kinda expensive which is weird and not expected for Cartegena I bought a swimsuit which cost $100 US dollars didn't realize till after. The movie theater is nice and the popcorn is awesome. The best thing about this place is the food court, which is exceptional for a mall. Very little global chain BS, and lots of Colombian meat and bbq. Semolina is a standout here. Good Wi-Fi throughout the mall. The stores are fairly dated (Esprit and Tommy Hilfiger), very expensive, and not all that great. We shopped around here and found pretty much nothing we wanted to buy, even though we were in the mood for spending. This is a very good shopping mall and it has everything you might need in a shopping mall.